How to Choose Your Impact Windows? | We are specialist. Call us! How to Choose Your Impact Windows? Do consider having impact windows, if you own a condo apartment or business premises in the coastal area or any place prone to hurricanes, tornadoes and straight-line winds. That’s because aside from the beautiful, tropical vibe presented, the overall safety and security of your home dwell significantly on the impact doors and windows selected. As a matter of fact, in Florida, Impact windows Miami with durable, laminated glass reduce the likelihood of the house getting damaged when large storms strike. However, even when impact windows and doors are undoubtedly useful, getting the best ones in Miami can be a long, daunting task. You can get anxious and forget the cardinal rules or miss on checking the sizing and costs. So, if you need to choose your Impact windows in Miami or South Florida, don’t forget to consider these tips. 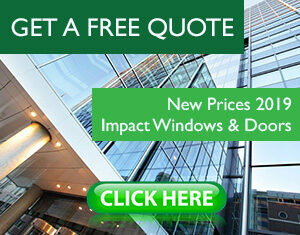 You can opt for custom-made impact windows or any of the standard ones. Customized choices are a bit more beneficial as they guarantee a snugly fit, thus ensuring no leaks whatsoever. Common types of these unique and useful windows are arch, oval, full circle, elliptical, hexagonal, Pentagon, half-circle among others. Single-hung or double-hung choices are available too, though their use is mostly limited to replacement purposes. Check our Catalog. Aluminum is sturdy, weather resistant, lightweight, and looks great. The only maintenance it will ever need is regular painting, and it is a great solution as impact windows or doors. Vinyl is an excellent insulator with high energy performance, though it is yet to be discovered whether it can be recycled. Wooden impact windows, despite their high energy efficiency and excellence as insulators, tend to rot away with time. It is the material that primarily dictates the price of the impact door, and that’s why fiber doors normally cost a lot more than wooden doors. Since you intend to use it as a “sacrificial” form of hurricane, tornado and powerful winds, choose an impact window that can reliably handle the worst of all conditions. The material also determines the strength and durability against wind-borne debris, and that’s why vinyl is widely the most trusted – never cracks, chip, warp, peel or blister. In Miami-Dade County, certification is taken very seriously given that its residents ought to buy the best quality impact windows. You must only buy from a contractor certified, widely-known, positively rated, and insured so that you are 100% confident of the quality of your purchase. Basically, ask for the proof of certification and insurance. Choosing who to install the door or window is just about as important as where to buy from. You can either choose the dealer as the person to install it or find an independent person. There’s nothing to worry about here since any qualified installer is granted the state permit and thus saves you the hassle of vetting the candidates for the job. But definitely, you can take us like the best choice to install your Impact windows and doors in your home. Please feel free to contact Impact Window Center in Miami. Cost and warranty also matter though it is the “no maintenance” factor that demands your attention. This entry was posted in Impact Windows & Doors Tips and tagged designer fixed windows, designer windows, hurricane, impact doors, impact window miami, impact windows and doors, impact windows center, impact windows florida, impact windows miami, miami windows. Bookmark the permalink.